Snorkeling camera care is pretty easy. All you have to know is a few tasks that you need to perform before and after snorkeling. There are also some tips here on avoiding the common problem of your camera fogging up inside and a few other care tips. 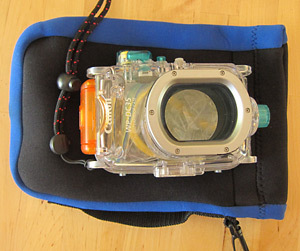 There is an easy snorkeling camera care process to keeping your waterproof camera and/or housing in good shape. It will help you reduce the chance of floods, sticking buttons, and corrosion. You can expect your camera and housing to last for years of use with these care tips. Waterproof housings come with a special o-ring grease. Carefully remove your o-rings from your housing. Some housings have two. Clean the o-ring, with a cloth and water. Make sure it does not have any sand, dirt or hair on it. Then apply a light layer of o-ring grease with your fingers. Don't overdo it. Just a thin coating all over will do. When you are applying the grease carefully inspect and feel the o-ring for any tears or other damage. If you find something, replace it. On waterproof cameras, you won't remove the seals, but you should go through the same process. Clean them carefully, inspect them for damage, and you can also lightly grease them. If you find damage you can have them replaced by the manufacturer. Before replacing your o-rings, carefully clean the groove that it sits in in the housing. Sand and salt crystals like to collect here. This goes for waterproof cameras also. Don't just clean the seal, but also the side of the opening where the seal presses into. Place your camera in the housing, put in a desiccant, and carefully close it, making sure no hair falls on the seal. Then test it in a sink of water to ensure there are no leaks, particularly before your first use of a trip. As mentioned below in tips about fogging, it is best to do all of this in the coolest, driest atmosphere (not by the beach or on a boat). Immediately after you get out of the water soak your waterproof camera or housing in fresh water. This washes away salt that will turn into crystals when it dries. These salt crystals are sharp and can harm your seals, and make buttons stick, leading to leaks. Most boat tours have a fresh water tank for this purpose. If you are at a beach, use a shower to rinse it. Sometimes when we don't have a fresh water source we will bring a gallon freezer bag full of water to rinse our cameras in, or you can use a small cooler. If that is not possible, then wrap your camera in a towel soaked in salt water, keeping it wet until you get to fresh water. This will prevent salt crystals from forming. When you are back at your room at the end of your snorkeling, give your camera another good soak. We do this in a sink, and will sometimes put weight on the cameras to keep them underwater. Work all of your buttons in the sink to dislodge any salt water and crystals. Occasionally wash your housings with a very mild dish soap, to remove oil, dirt and sunscreen. Although we don't apply new grease every time we snorkel, we do it at least once a week when snorkeling. But we do carefully inspect our seals for dirt, sand and salt crystals every time we open and close the housing. When you are done snorkeling, and have done the steps above, remove your o-rings, grease them, put them in a zip lock bag, and stick them inside your housing. Don't leave your o-rings in their grooves long term. They will get flat spots, become stretched, and will cause failures in the future. Also, don't travel your camera housing closed up with the seals in. The air pressure changes in the airplane may cause problems for your housing. Before storing your housing, or if you have sticky buttons now, apply some silicone oil into the button holes, and work the buttons, to lubricate the tiny seals. Wipe away excess. 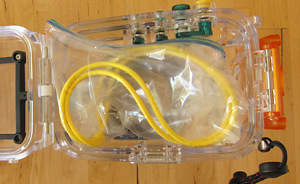 You can use Aquaseal Silicone Pump which most dive shops carry. Or get 100% silicone oil that is commonly used for air gun lubrication. 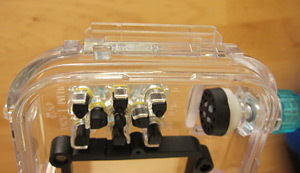 If your buttons are really sticky, you can take them apart and clean and lubricate your seals directly. Read this site for how to do it. This is basic snorkeling camera care, but few people do it. Periodically clean your camera lens with a lens cleaning cloth and solution. A dirty lens will give you pictures with dust spots. This is hard to do, but some sunscreens can cloud plastics. So try not to get sunscreen on the lens area or on the screen area in particular. Having two batteries can be a real life saver. Keep both charged up. I have had very good luck with third party batteries. They cost about a quarter of a camera company version, and work as well. I have had good results with SterlingTEK on Amazon.com. Many camera buffs recommend them. Keep your lens and screen from getting scratched up. When you we are transporting our cameras and housings we use neoprene cases to protect them. You can find them on amazon here, and they come in 4 different sizes. A fogging up camera can be a real pain, and it happens with waterproof cameras and underwater housings. Basically either the lens or the screen forms water condensation on it, inside, making it hard to see, and ruining pictures. Most of the time this happens in hot humid places, which is pretty much every tropical snorkeling situation. We have figured out some solutions though. It mostly happens when the temperature inside the camera or housing goes up, from either the sun, or from the electronics putting off heat. Try not to open the housing or waterproof doors while in a humid environment, like on a boat, next to the water, or when the housing or camera is wet. Preventing moisture from entering the camera or housing is the goal. If you have a housing, putting fresh desiccant moisture absorbers inside can help a little. Load the camera into it's housing in a dry cool place, like your hotel room, before you go out. Same goes for waterproof cameras. Load the battery and memory card somewhere cool and dry. Once the camera is closed up, keep it out of the sun before entering the water. If it gets hot, and then quickly cools in the water, it will form moisture inside. Get in the habit when walking to the beach and into the water of hiding your camera from the sun. You can also keep the camera cool before entering the water by wrapping it with a wet towel or keeping it in a cooler. Once you are snorkeling avoid pulling the camera out of the water into the sun to look at it. This is sure to cause fogging. Turn the camera off when you are not taking pictures. This will reduce heat buildup. Also try not to use flash; it produces a lot of heat. Doing these things should prevent the fogging problem. That is it for our snorkeling camera care tips. We will add more as we think of them.